Imray's fully-functioning charts app for iPhone and iPad. 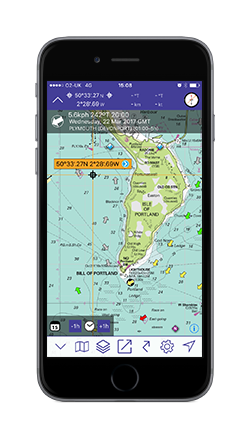 Based on high quality raster images of Imray and selected official hydrographic office charts, the app converts your device into a fully-functioning chart plotter. 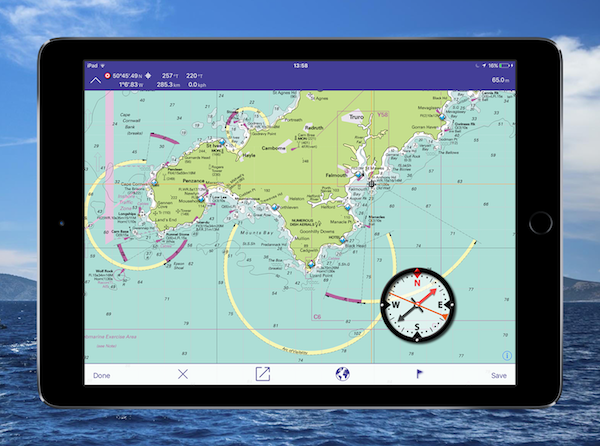 Download the free Imray Navigator app from the App Store, including navigation tools and instruments and demonstration charts. Get access on a subscription basis to an entire library of chart sets, including Imray’s award-winning raster charts plus a selected range derived from other hydrographic offices including France, the Netherlands and Germany. Your annual subscription gives you quarterly updates with corrections and new chart editions. Download charts onto your device, delete and redownload at any time. You will be able to keep your charts even if you end your subscription. Zoom and pan seamlessly across multiple charts for easy routes planning. Contains the GPS software and navigation tools and demonstration versions of charts of the English Channel. Pan around the world map to find the chart area that you want to see. Pinch and zoom to find the chart area that you wish to view. Double tap to zoom in for more detail. The app has the visual advantage of raster charts and the strong cartography associated with that. A high level of detail is kept when zooming in and out of raster charts. The charts in the app are exactly equivalent to the paper charts for that area. This data is assisted by a mobile network connection for the initial location, but it does work independently and can lock onto to GPS satellites anywhere at sea. Bluetooth independent GPS receivers such as GNS devices, e.g. BadElf or Dual. These receivers are paired to the iPhone or iPad through Bluetooth and the GPS data is received by the Charts app. There are significant iPhone and iPad battery advantages in using an external device as power drain from the GPS hardware in the iPhone or iPad is significant (five times that of the screen). NMEA. The app is also compatible with location data received from an on-board GPS receiver on the NMEA bus. 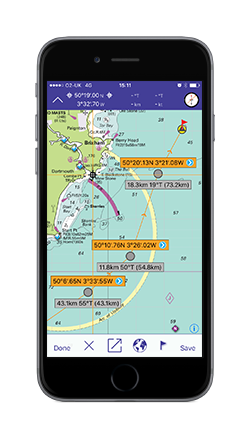 Charts are stored in the app so no connection required when planning or at sea. 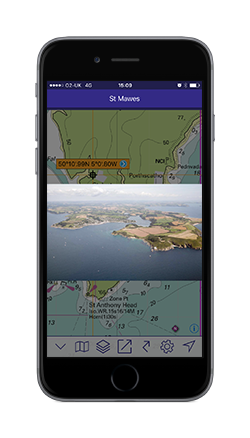 Contains NMEA and AIS functionality, enabled by separately purchasing and downloading the Boat Instruments app. The AIS screen shows relative position, speed and course for nearby targets that the on-board AIS receiver is reporting. A minimum safe distance can be used to show warnings about potential collisions. The relative direction of travel of targets is shown in colours to indicate relative position in 5, 10 and 20 minutes.